Happy Holy week. 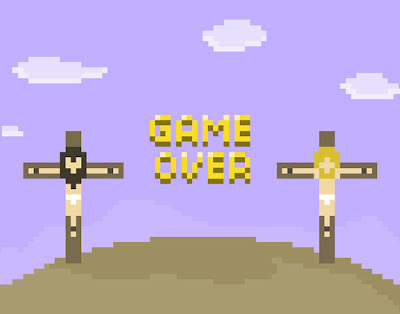 Let's all celebrate with a good ol' fashioned religious video game. See how many Apostles you can score! Walk on Water! Feed the Masses! all in under 10 seconds. it took me a little while before i learned how to walk on water. Hi again! I also replied to you on my blog (I couldn't find your contact info on your site). Please feel free to post the poem with your image (and a link to my site or my name, if you don't mind? ).